Traditionally thought to be that of Sir Thomas Browne by William Dobson. If you look at the picture of Thomas and his wife Dorothy painted by John Souch, there is a resemblance, so there is some reason to think this is John and his family, but no conclusive proof. 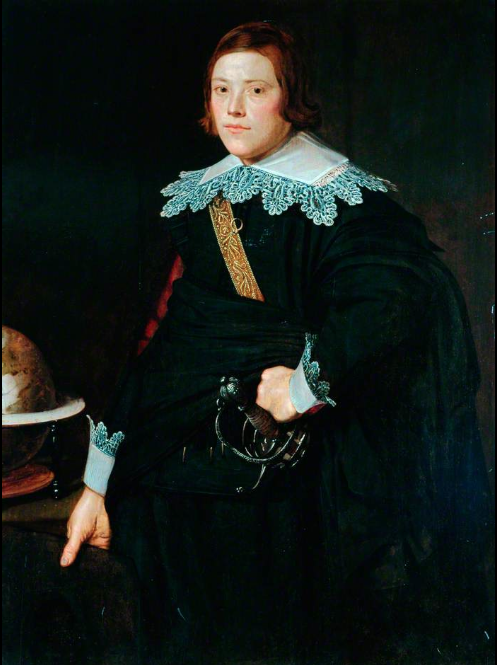 He could have been in Oxford at the same time as Dobson, though as he was native to Norwich, would he have transported a young family across war torn England to Oxford to have a portrait painted? 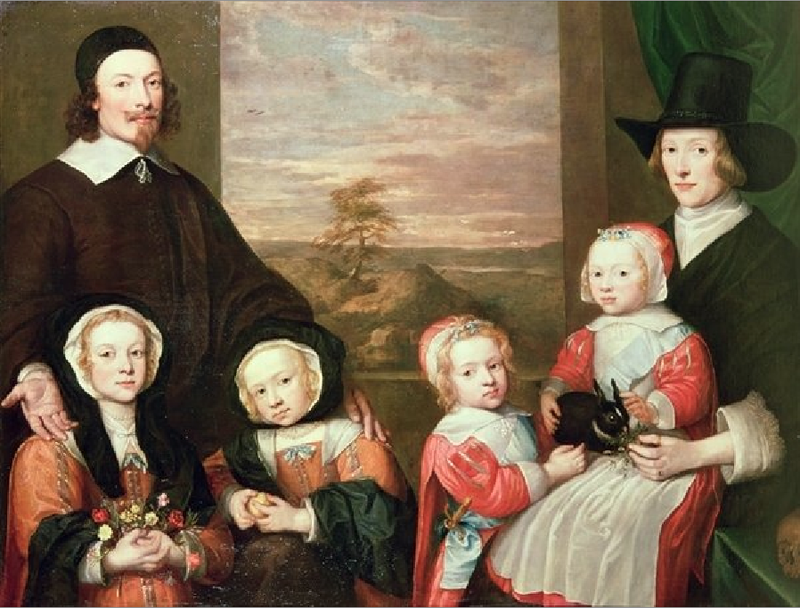 Anyway, this is a lovely family group and their clothes put them firmly in the 1640s. They all look unerringly at the viewer, daring us to stare back. John (or whoever) is wearing a brown, (or what most people would have thought of as black) coat with a plain falling band and a simple black day cap. His wife is wearing a smart wide brimmed hat and what looks like a cream bodice under a dark mantle or wrap. The children are all in petticoats, though I suspect that the two on the right hand side are boys wearing red petticoats with linen aprons, bands and matching caps. The boy on the left has a small sword suspended from a blue ribbon, whilst the lad on the right is more interested in his pet rabbit. The two girls on the right, (they look old enough to have been breeched were they boys) are wearing russet coloured waistcoats with plain linen kerchiefs and black hoods over their coifs possibly indicating that they have lost siblings. John Browne lost several children at an early age (five out of eleven) so that fits with the Thomas Browne theory, though losing small children was by no means unusual. Thanks to Chatsworth for permission to post this image. The painting is © Devonshire Collection Chatsworth and reproduced by permission of Chatsworth Settlement Trustees. or Cornelius’s Tub, a comedy performed entirely in Latin from Cambridge and possibly written by Thomas Randolph in 1638. The subject was the quest for a cure for syphilis and the frontispiece by William Marshall shows Cornelius our hero in a sweating tub (which was one of the more popular treatments) being observed by three ladies, presumably his previous conquests. 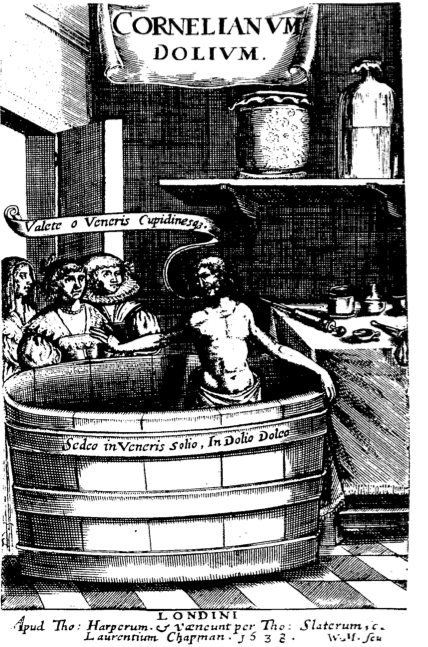 He is clad just in his drawers, and a speech bubble coming out of his mouth reads “Farewell O Venus and Cupids”, whilst the caption on the tub reads: “I sit on the throne of Venus, I suffer in the tub” The ladies are high class, dressed hair and fashionable bodices. The right hand Cupid has a collar ruff rather too, not necessarily a common item of neckwear for the period. Notice also the selection of instruments on the table. Painted by an unknown artist in 1633, Captaine Bushell was a naval officer and something of a dashing rogue who captured the royalist pinnace Henrietta Maria in a night raid without a shot being fired in 1642. Later in 1643 he used his knowledge of artillery in the successful defence of Scarborough Castle, but changed sides the same year. 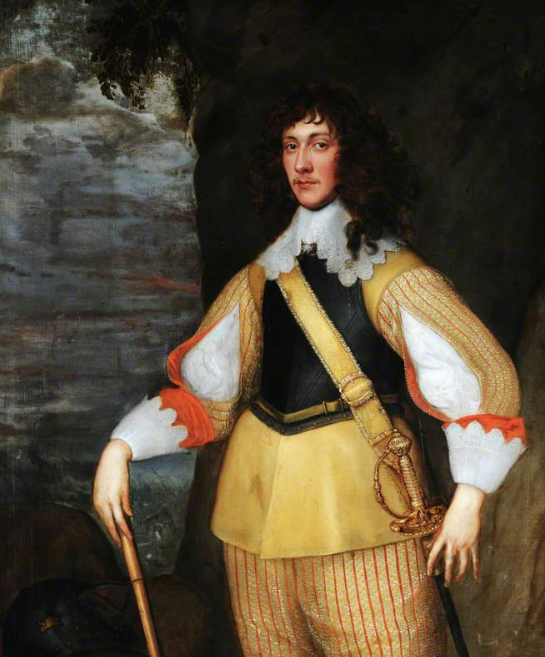 He led several daring raids on parliament shipping after that and eventualy fell foul of his opponents, being executed in 1651, on the same block and using the very axe that was used for the King. 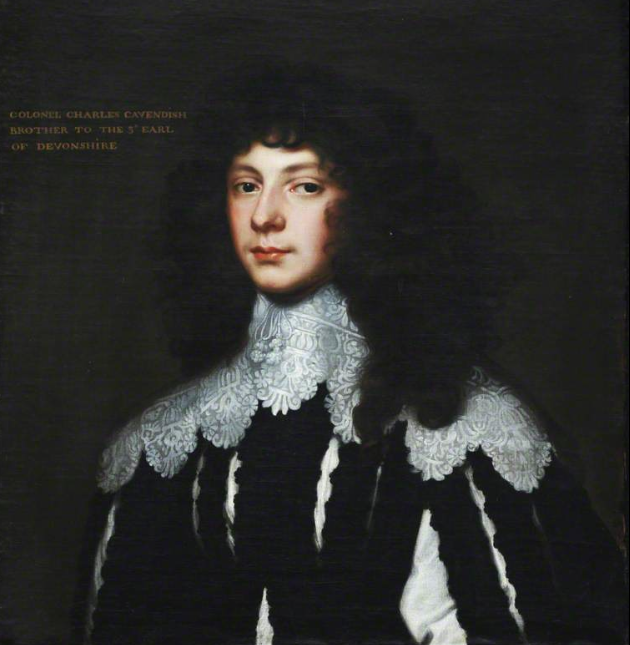 Here he is, well before those exploits at the time he married the girl he met in the Low Countries, bareheaded in a black doublet with red lining, cuffs and matching laced falling band with a black waist scarf and and embroidered baldric holding up his splendid mortuary sword. The picture hangs in Whitby Museum. 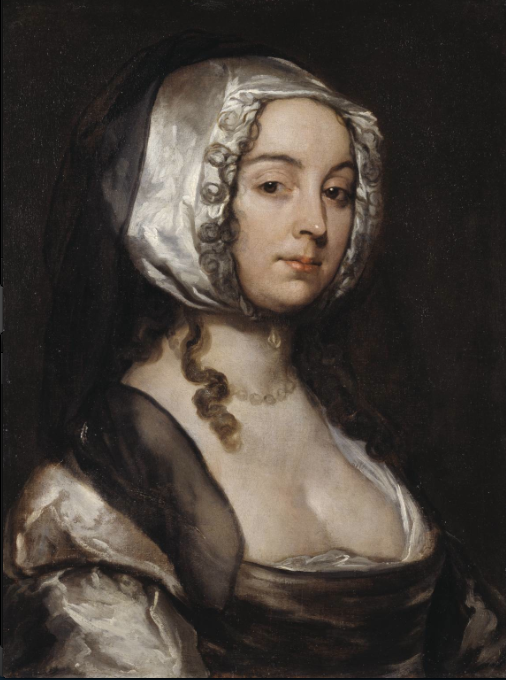 By William Dobson, thought to be his second wife Judith. She is quite informally dressed (notice the curls escaping from her coif) in a cream satin coif and matching low-cut waistcoat with glimpses of her smock and some kind of diaphanous black wrap around her head and shoulders. The picture is owned by the Tate Gallery but at present is not on display. The Colonel in less warlike dress in a painting in the style of Anthony van Dyck which also hangs in Hardwick Hall in Derbyshire. He is wearing a figured and slashed black doublet showing his white shirt below and an impressive cutwork falling band with decorative pom-pom tassels on his band strings. The text is pretty inflammatory from the start, the author states: ‘although the Cavaliers says and swears (dam them and sinck them), they fight for Religion we have no cause to believe them and this we may well be sure of one thing they meane us no good when every day they are preparing all manner of bloody ingines to destroy us’. He goes further still: ‘for if the Cavaliers once get the upper hand of your Cities, Townes and Houses, you may well bid farewell religion, farewell Lawes, farewell the Liberties of us poor Protestants for ever’. 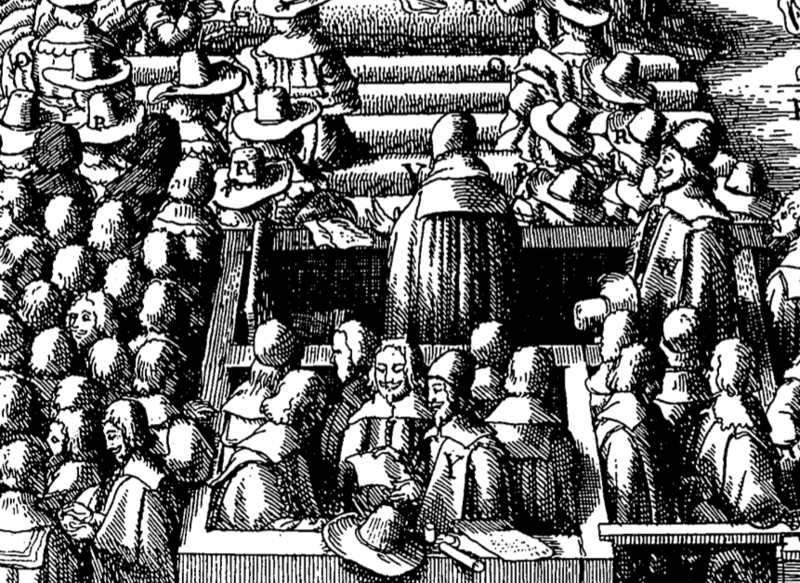 The woodcut on the front shows three citizens of the capital on the left in their professional clothes, smart hats with upturned brims, cloaks, doublet and breeches, being offered a bag of money and military service by the three countrymen on the right. 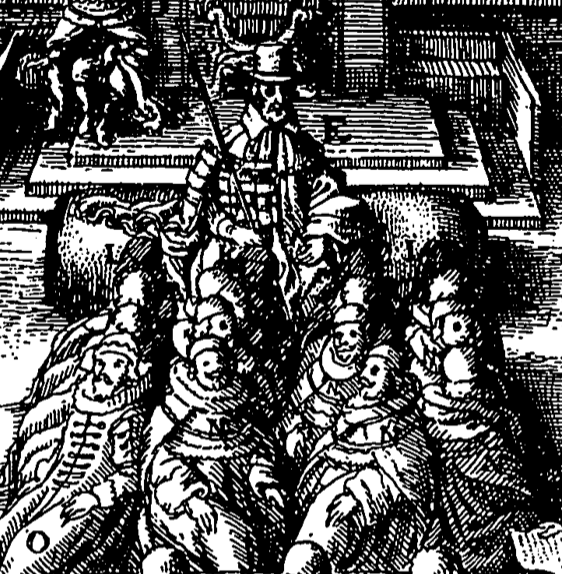 You can see they are more parochial, their hat brims turn down, the crowns are more rounded and they are dressed in long coats rather than cloaks and doublets. Wherein they declare their hot zeal in sending their husbands to the warres, in defence of King and Parliament, as also the proceedings of the King at York, with their full determination in maintaining this their Resolution, to the admiration of the Reader. 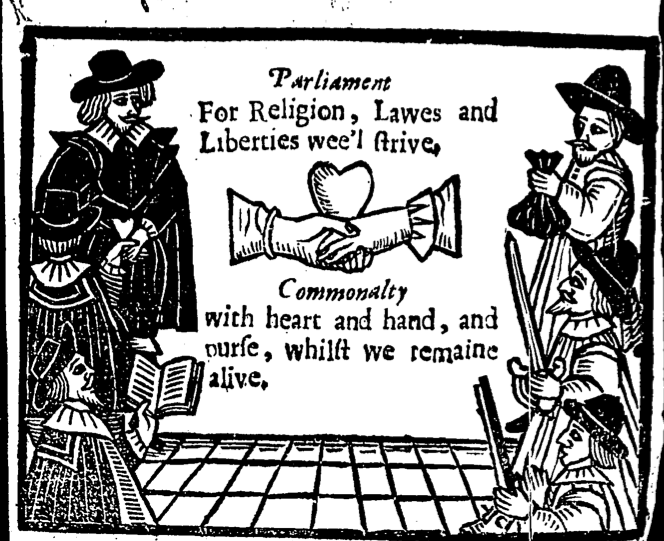 This was a political tract published during the ‘phoney’ war of 1642 before hostilities had been declared and whilst King and Parliament were still jockeying for position. There was obviously a lot of activity at the time (notice that George Thomason has added the date Aug 26 over the picture), as on the first page the anonymous author mentions ‘daily noise of Drummes’ and ‘the powder which is continually spent, together with the cracking of Guns in the streets’ . Perhaps there was an ulterior motive in this exhortation to the men as she goes on; ‘our continual scolding shall make them goe to the warres, and then we will in our husbands absence, live as merrily may be, drinke, feast and walk abroad’. The woodcut is obviously reused. 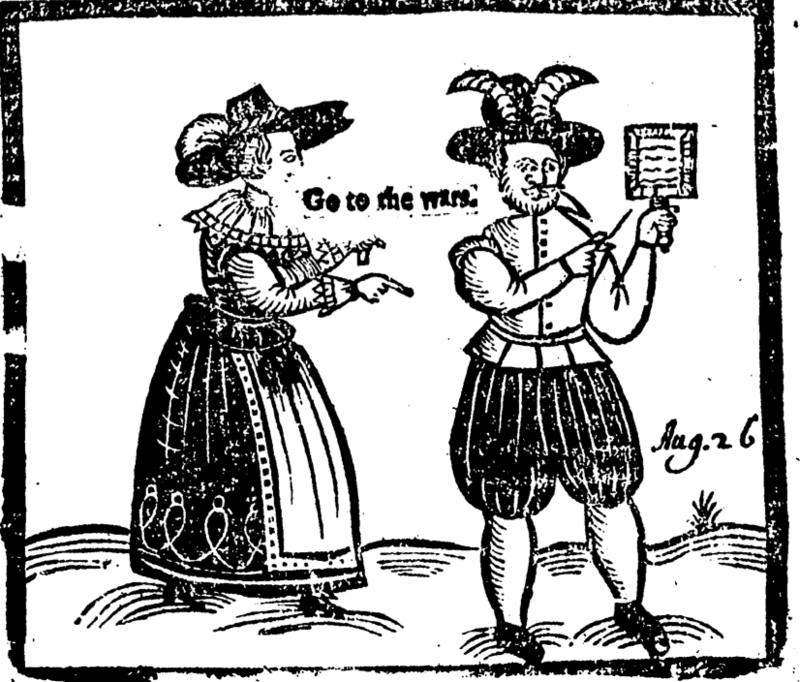 The speech bubble has been crudely added and there is no reason in the text for the man to be wearing cuckold’s horns or holding a writing tablet, but it’s a nice image of a respectably dressed couple from the time. She is wearing a wide brimmed hat with plumes, a fine laced kerchief and cuffs, waistcoat with sleeves of a different colour to the body, a decorated petticoat and apron. He has a hat through which his horns protrude, a short tabbed doublet, plain band with breeches and hose. The left hand figure is an independant cleric, dressed in his gown over a doublet with some nice long buttons, a wide brimmed hat and a ruff. 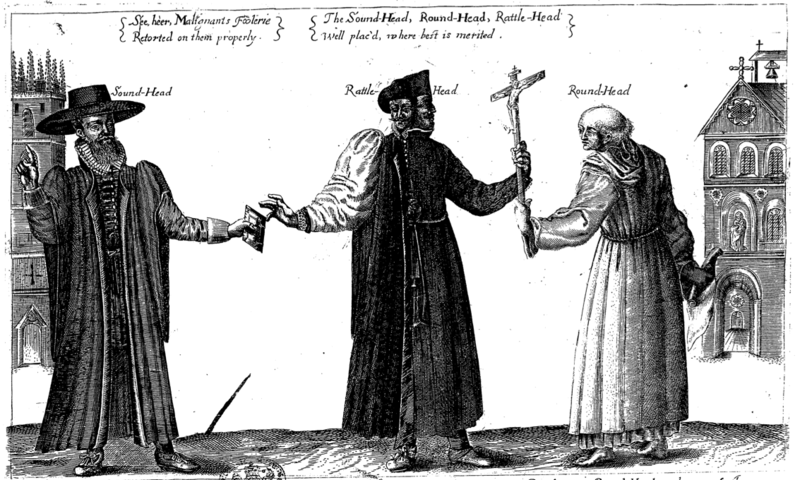 The next figure in the centre on one side represents Archbishop Laud in his bishop’s rochet (the bishop’s surplice), chimere (the black gown) and square cap, and on the right a catholic priest in cassock and biretta. 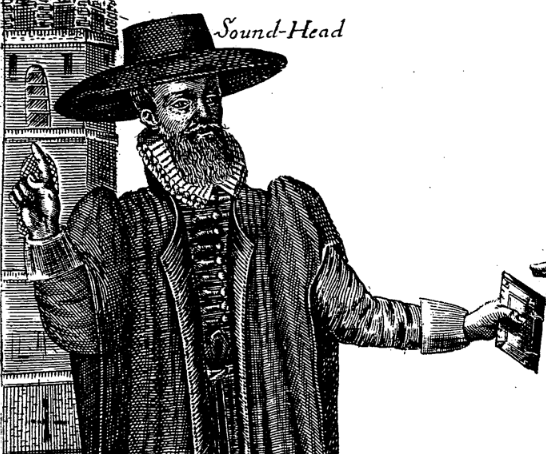 It’s thought that he is supposed to be Robert Philips who was the Queen’s confessor who had been locked in the Tower for refusing to swear on a “heretical” English bible. At the bottom, the details of the shoes are nice too. The puritan has the widest side openings though. of both Howses of Parliament upon the tryal of Thomas Earle of Strafford, Lord Lieutenant of Ireland. 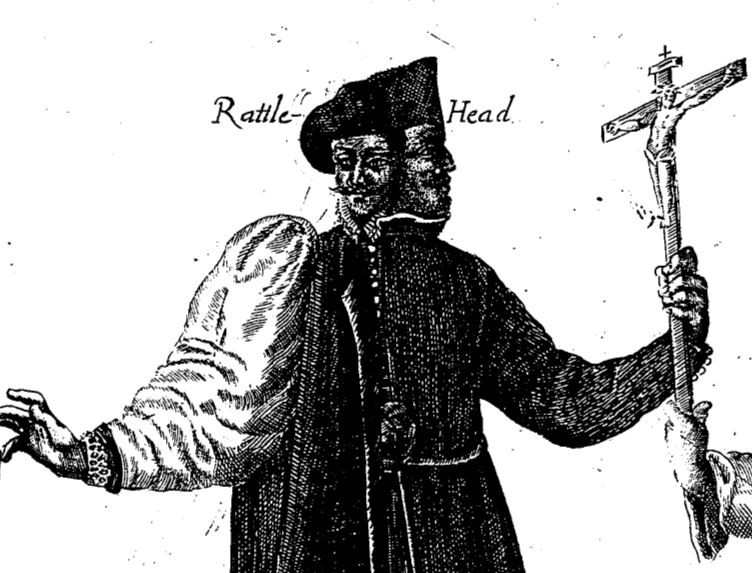 Etching by Hollar published together with the picture of the subsequent execution in 1641. 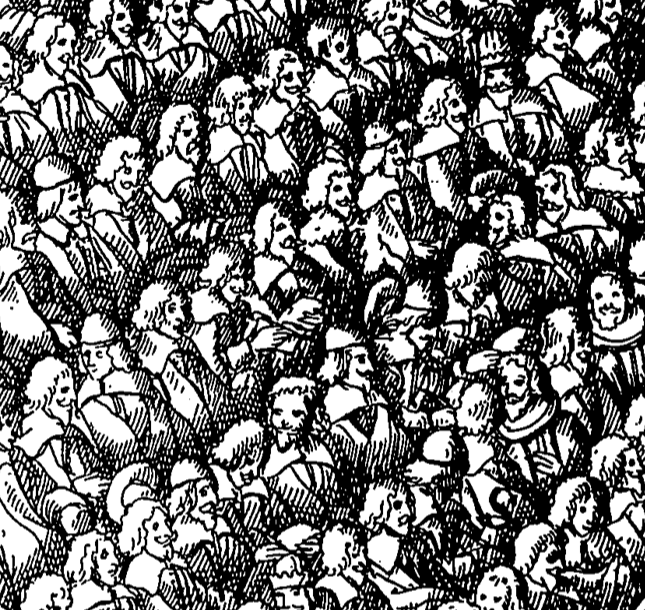 I’ve already blogged here about the second picture which shows many more common folk in the crowd that gathered, but here are the great and the good of the land in 1641 gathered for the show trial. As ever in these images it’s the details that add to our knowledge. Here is the good Earl (letter V) in a cloak and daycap with his falling band pulled out to cover his shoulders. This is a common fashion, notice most of the assembly wear their collars in the same fashion, though you don’t often see the reverse view. 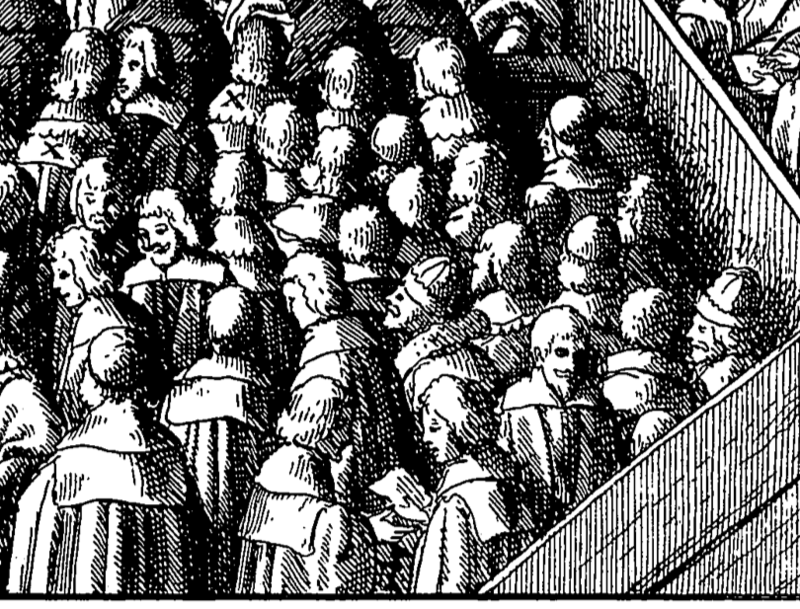 There are a few caps sprinkled about in the throng but most are bareheaded, much in the fashion recommended for church attendees, only the old and infirm were allowed caps during prayers. This little group foreground right are the plaintiffs, all in cloaks with falling bands visible as before. You can see the construction of the crowns of two of the caps too, some of which are also edged with lace. 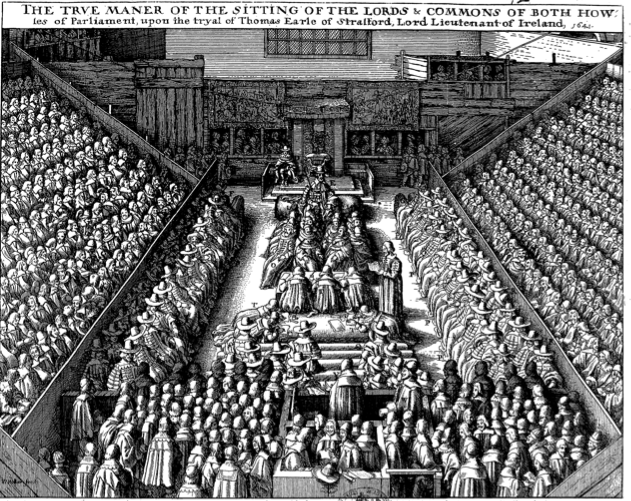 The main body of the commons, most have their cloaks gathered about them. It must have been cold in the hall during the trial. A few glimpses of doublets are visible below the cloaks as are one or two round collars which I guess are ruffs. There were worn during this period by the older generation and professional men. Also spot the guy in the middle taking notes. Here the judges and barons and the Lord High Steward the Earl of Arundel who is still wearing his hat as are the two front rows below the rostra on either side. Maybe they were permitted hats as they didn’t actually block anyone’s view where they were sitting?